Note: SLiteChat was announced as “end of lifed” in July 2015. 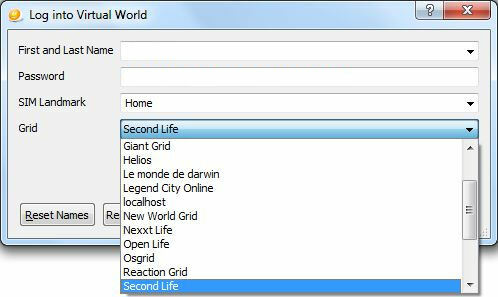 We’re all familiar with the Second Life Viewer in one flavour or another. But what about the non-graphical “lightweight” clients that are available for accessing SL when using a “full” Viewer isn’t always an option? Like the Viewer, these “lightweight”, or text-only clients come in a number of flavours, some of which – Libretto, Metabolt and Radegast – I’ve previously looked at in terms of the Windows platform. 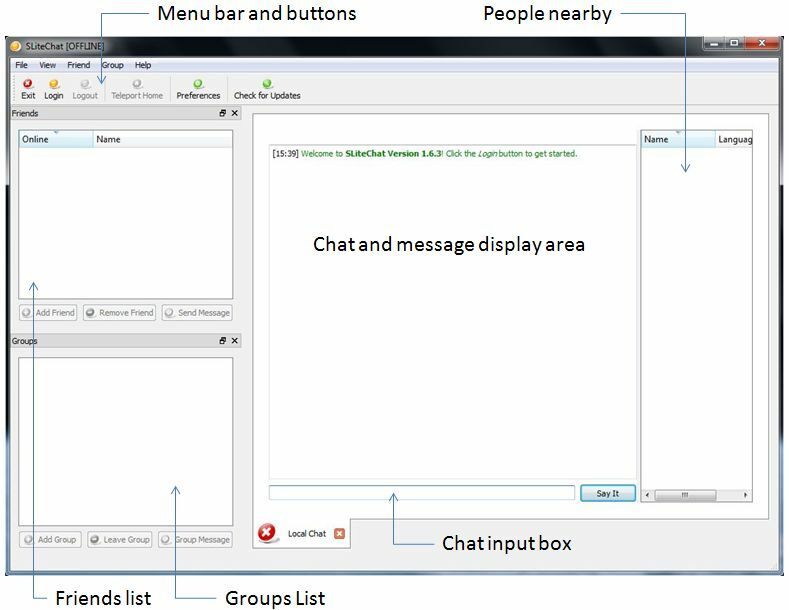 SLiteChat is another such client, available for Windows, Linux and Mac, and it gets the Pey treatment here. In terms of overall functionality, SLiteChat sits on the Libretto side of the scales – if all you need is a rapid means of logging-in to SL and conversing and carrying out some basic tasks, it is ideal. It installs smoothly from the .EXE (binaries also available), and when launched – unlike the first three clients I reviewed in this series – doesn’t present you with a log-in screen. Instead, the application window is displayed, with a prompt for you to log-in. Check for Updates: will poll the SLiteChat website for any available updates. Clicking the Login button displays the logging-in floater. Log-in names are stored by grid; so if you log-in to multiple grids, select the grid first, and this will enable a list of avatars used to date to log-into that grid when the arrow to the right of the First / Last Name field is clicked. The Grid drop-down (shown above) contains a pre-defined list of grids, which is slightly out-of-date at present. Remove a Friend: left-click on a name in your Friends list and use this option to remove them as a Friend. IM a Friend: left-click on a name in your Friends list and use this option to IM them – a separate tab will open in the main chat and message display area. Help: Displays the Help floater and checks for updates to the application whether or not you are logged-in. 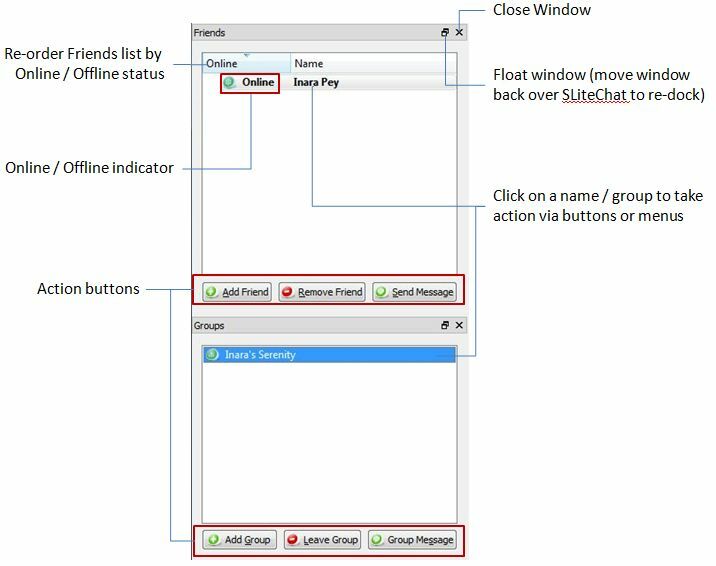 The Friends and Group list windows each have their own buttons and options. The options are pretty self-explanatory, with the action buttons mirroring those found in the Friend and Group menus (with the caveat the latter menu options remain greyed out in the 1.6.3 release). As noted above, closing one or other window will automatically expand the other to fill the space, while closing both will expand the chat / message display area into the space. It’s also worth nothing that friends are automatically displayed alphabetically (first name) and split between online and offline. The Preferences button / menu option (under File) displays a floater of personal preference options for the client.These options are all fairly self-explanatory, although not all appear to be functioning properly. The options to save conversations (alongside the FILE -> EXPORT SAVED CONVERSATIONS) do not appear to be functioning. The SLiteChat website provides download links and basic documentation – including how to install, for those that would prefer to download the binaries – and a very good FAQ on common issues. 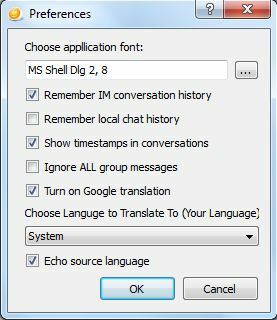 SLiteChat does precisely what it says on the box, and provides a clean, quick text-based client. It equals Libretto in most respects, although some functionality doesn’t appear to be entirely there at present. In the case of Groups, and the Group menu, this isn’t a problem, as the Group window action buttons all work. Some of the Preferences options do appear to need further work – either that or I was having a bad tech day when playing with the client. The Grid list needs updating, somewhat as well – and it would be nice to have the ability to add your own preferred grids to the list. I’ve no idea where development stands at the moment – this release dates back to February 2011; I’ve IM’d the developer and will update here with more info should it come through. However, none of the above stop SLiteChat from being a good, lightweight alternative to accessing SL when you’re unable to use your Viewer, and is certainly capable of letting you stay in contact with friends in-world. Is this application alive still? No. SLiteChat ceased development in 2015.